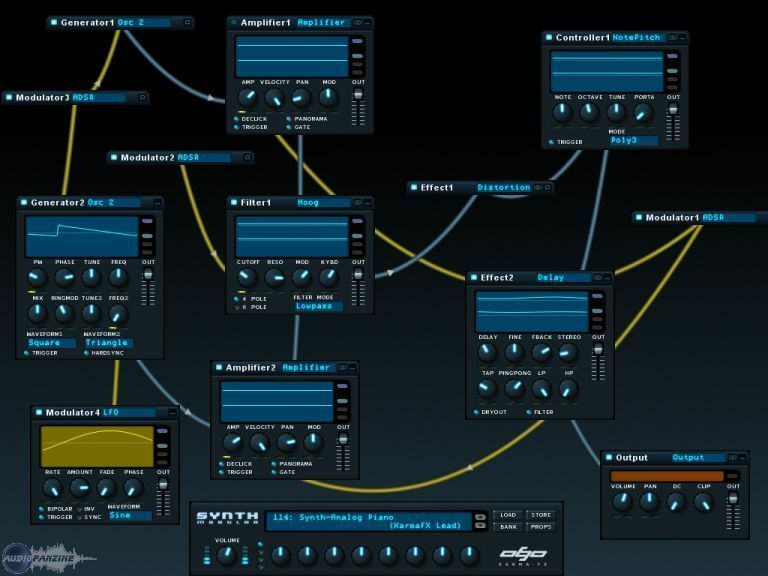 Synth Modular, Virtual Modular Synth from KarmaFX. 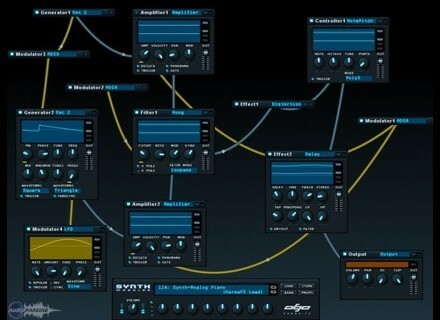 KarmaFX Synth Modular has been updated to v1.05. Speed of oscillators and unison modules has been improved significantly. Noise generator now also works in stereo. Added silent output detection to filters to reduce CPU load in polyphonic patches. Chorus sound has been improved: Depth and delays range have been increased from 80ms to 200ms. Max number of stages has been increased from 3 to 8. A delay modulator is allocated per stage to let LFOs run out of phase. New "phase offset" parameter added for controlling LFO phase. "Straight" unison is now the default mode in Unison module. Bugfix: Sampler would not trigger on very first note when GUI was minimized. Fixed. Bugfix: Switching a module connected to the notepitch module between stereo and mono could cause notepitch module to loose a polyphonic voice. Fixed. Bugfix: Notepitch module could in some situations play the same key in two or more polyphonic voices, causing the amplifier to leave hanging notes. Fixed. Bugfix: To prevent hanging notes, the Amplifier and Notepitch modules are now reset when the midi stream is interrupted. Bugfix: Silent modulators would not free the CPU as much as disconnected modulators. Fixed. Bugfix: Midi events are now deltaframes sorted to prevent midi trigger inconsistencies in different hosts. Bugfix: Pseudo random generator in LFO is now reset on trigger and transport change for true deterministic randomness. Bugfix: SFZ parser would fail and crash the synth on files without newline breaks after sample filenames. Fixed. Bugfix: Damping was computed wrong in reverb module causing unwanted ringing. Fixed. Bugfix: Amplifier would not always pass sound when trigger was off. Fixed. Bugfix: Infinite loop test could crash the synth when making a new connection in a patch with a working infinite connection. Fixed. Bugfix: EQ31 settings were not cloned correctly in polyphonic mode. Fixed. Bugfix: Synth did not respond to "all notes off" midi event causing hanging notes in some hosts. Fixed. Bugfix: All LFO instances did not reset on transport change. Fixed. Bugfix: Synth would crash when saving Sampler module patches with sample filenames longer than 127 chars. Fixed. Bugfix: Backward loop mode in sampler could cause overflow error. Fixed. GUI: Bugfix: The background color of EQ31's display was wrong. Fixed. User's Manual has been updated to revision 1.12. Check out www.karmafx.net for more info. U-He Zebra Tutorial Videos Urs Heckman has started his own YouTube channel where he shows the workings of Zebra. Leapfrog Audio Rephrase Discount Leapfrog Audio has announced that Rephrase is now available for purchase at the permanently reduced price of $75 / €59 / £49. New Balinese Gamelan At Discount Price Soniccouture has announced the availability of its Balinese Gamelan for Kontakt in two new, smaller products.